Fifth Avenue is getting a fast fashion facelift. But among the throngs of retailers investing in flagship stores deep in Tiffany territory, one is standing out. 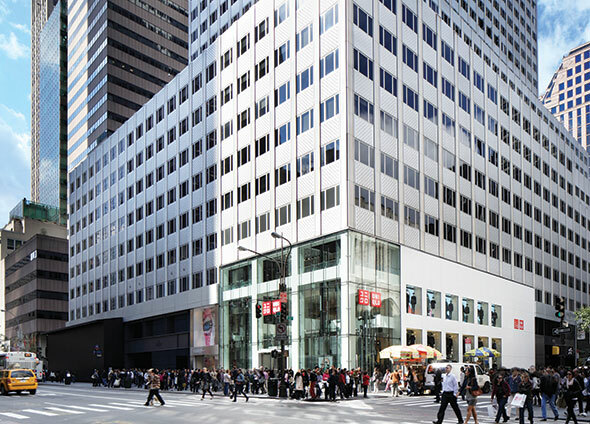 Meet UNIQLO, the Japanese retail giant whose latest U.S. store resides at 53rd Street & Fifth Avenue. The three-story glass cube invites us into another world—an enormous 89,000-square-foot flagship masterfully designed by Masamichi Katayama of Wonderwall. Masamichi set out to create a chic modern shopping experience using glass, oak, steel and cutting-edge technology. Within earshot of the store’s entrance a subtle voice invites you inside—just a sampling of the subliminal messaging to come—and it’s an invitation you won’t want to refuse. The entrance is a 50-foot atrium, suspended by evenly spaced white pillars creating a vast, cathedral-like ceiling. Light is everywhere. It bounces off of the five-inch oak plank floors and carefully leads the eye to low wooden tables offering UNIQLO’s prized ‘affordable cashmere,’ neatly folded in squares of organized color. The striking use of wall space is unique. Mannequins, anticipating the crowds, are raised safely 15 feet in the air for coveting eyes to admire. Clothing is shown entirely on face-out racks, while stock is arranged in floor-to-ceiling columns of color. The rainbow effect is brilliant; the maintenance factor unimaginable. Mihee Yi, UNIQLO’s Visual Merchandising Director, has her work cut out for her. “We change the entire layout of the store including windows, mannequins, posters and general setup every two weeks,” explains Mihee. The store has a “round-the-clock 24 hour merchandising team and 26 full-time merchandisers” perfecting the endless rows of color. The look is modern and vibrant, with multiple piles of candy colors creating an Alice in Wonderland-like effect, while the backlit stairs change color to create a perfect mix of motion and playfulness. It is a futuristic version of the 1970s.The opulent entrance is intentionally interrupted by a mammoth set of industrial escalators luring you up. With retail space at a premium, an open format obviously results in lost floor space and therefore revenues. This is a bold move rarely seen in New York City and makes this magnificent view all the more luxurious. Once exalted to the glass-lined third floor, you might wonder if you’ve entered a space station of sorts. Don’t be alarmed, this is where the real shopping begins. After being greeted by a staff member wearing a headset that amplifies his cheerful greeting, you will quickly notice there is a multitude of technological innovations at work here—not surprising for a Japanese company. The store informs in one way or another: the walls signal the latest trends; moving LCD screens transmit the company’s latest ad campaign; the signage indicates the price; the sound system quietly announces sales. Everywhere you stand it’s as if the store designer anticipated what you were thinking and responded accordingly. The result is a perfect blend of orchestrated chaos and the ultimate in customer service. You feel well taken care of before even speaking to one of UNIQLO’s 650 employees. Finally, you end up at the infamous LED tunnel, adorned with red flashing ticker tape announcing the latest temptations. UNIQLO’s use of technology is designed to make you feel informed, hip and instantly part of the store’s culture. This is UNIQLO’s largest store in the world and the $300 million price tag marks the company’s commitment to the US market. The store’s completion took a year and a half from lease signing to opening. The high price of precision design has paid off. All three of UNIQLO’s NYC stores are performing well, including the latest on 34th Street and the original SoHo location. Shin Odake, CEO of UNIQLO USA says, “The UNIQLO 5th Avenue Global Flagship exudes the best in design, customer service and technology.” We concur.